Technology is one of the main drivers of competition in the ever-growing market these days. And you simply have to keep up with the tech trends to keep up with the competition. The same goes for your maintenance processes and strategies. 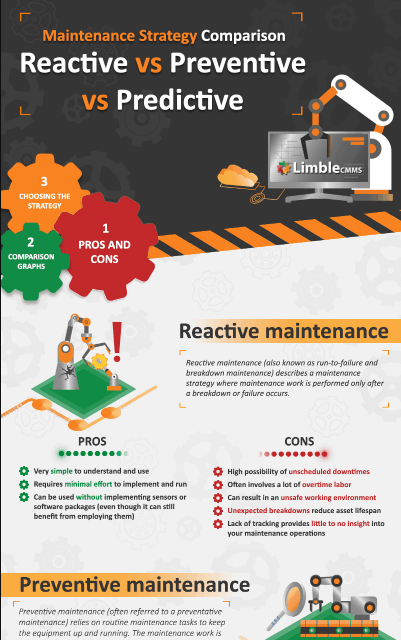 But which types of maintenance should you implement? Are you using the right ones for your business? Reactive maintenance - based on a run-to-failure method of reacting after the problem occurred. Preventive maintenance - which presents an ongoing process of constant maintenance to reduce potential failure at all times. Predictive maintenance - the one that uses a constant flow of data and smart systems to accurately predict failures and problems so you can deal with them just before they happen. All this is represented in terms of pros and cons, implementation costs, training and software requirements, potential ROI, and more.